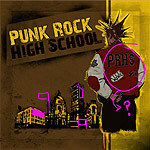 CD review: "Punk Rock High School: Soundtrack for the Motion Picture"
Forget the name: the music on this project out of El Camino High School in Oceanside has very little punk, but is instead a collection of hip-hop, pop, hard rock, ska and alternative. And this release, though impressive musically, might be a case of putting the cart before the horse as the soundtrack is done long before the indie film it's meant to accompany. Tom Voris, a member of the San Diego-area band The Fabulous Rudies, is also a teacher at El Camino. When students that had their own bands going approached him about being the faculty advisor for a new rock band music club they wanted to start, this project was born. Among the student bands found here are hard-rockers Without Warning, whose driving yet catchy "Don't Lead Me On" kicks off the album; Midnight Rose, which shows a mainstream rock sensibility on "Let's Go," and Durty White Chucks, whose "Hip Rock" revisits the 1980s Aerosmith-Run-D.M.C. rock-rap melding with pretty good success here. Established San Diego bands with tracks here, besides Voris' Fabulous Rudies, are reggae rockers Irieside  but alumni of El Camino are represented in its ranks. Thirteen tracks in all, a broad variety of styles  but top-quality music and production values across the board. Some indie labels never put together such a balanced package of playing and presentation; for a high school club project, it's quite impressive.